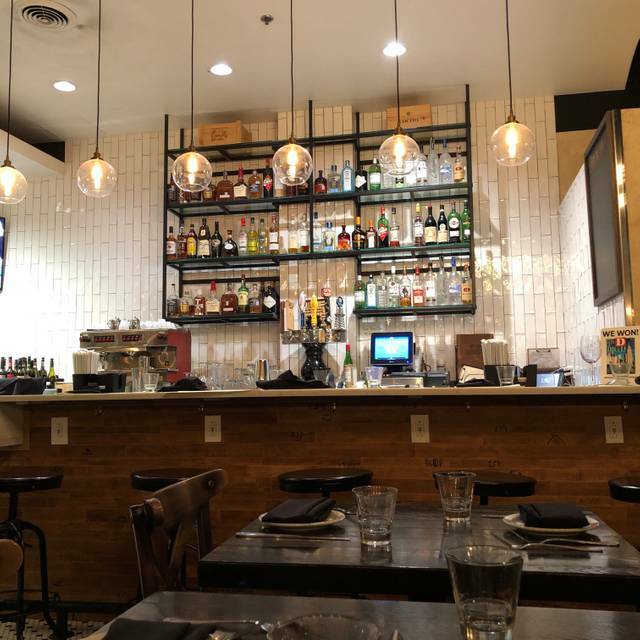 You must make reservations at least 5 minutes in advance of the time at Dough Pizzeria Napoletana. 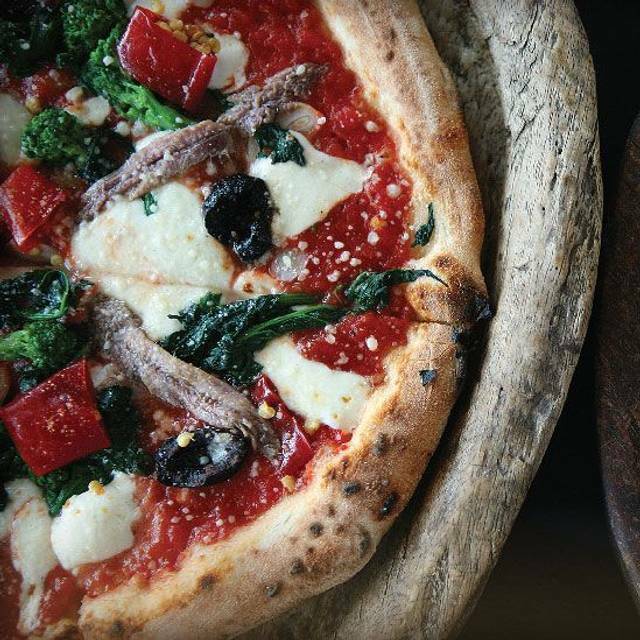 Doug and Lori Horn opened Dough Pizzeria Napoletana in San Antonio, Texas in November of 2007. Doug and Lori have extensive schooling and experience in both the hotel and restaurant business. When they decided they wanted to open a pizzeria, it was clear who would do what - Doug would run the front/back of the house and Lori would assist in the front and concentrate on the marketing. It was a perfect match! The food is excellent. Love how fresh everything was. None of us had tried polenta cake before, and it was amazing. The coffee was also delicious. Will definitely go back, but wish the atmosphere was more like the San Antonio location. Loved this place and will be coming back! Good fresh homemade pizza and sauce!! After watching an episode of "Diner's, Drive-Ins and Dives", my husband and I were excited to see that a Dough restaurant was in Plano. We made a reservation because it was Saturday night, which I recommend because it is a small place. I was so excited to try the Papardelle pasta with pork short rib sauce that I saw them make on Triple D only to find out that is not on the regular menu! We ordered the FIOR DI LATTE BURRATA (HOUSE PULLED MOZZARELLA FILLED WITH STRANDS OF MOZZARELLA AND CREAM) which was delicious and filling. 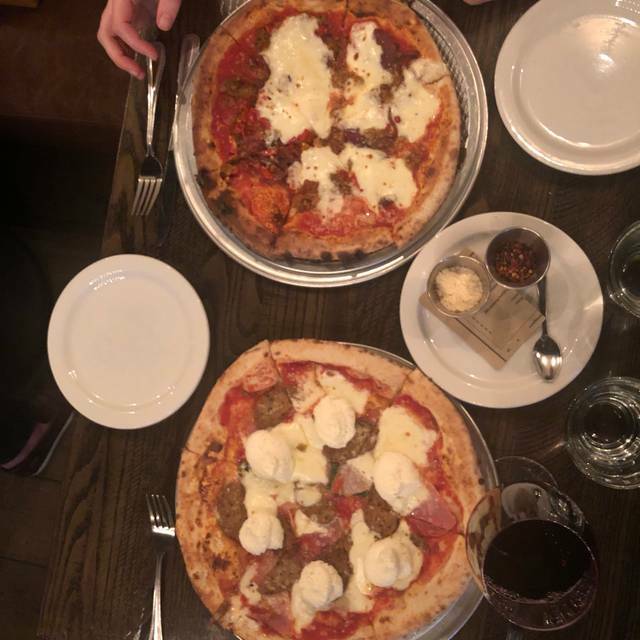 My husband and I both ordered pizza's as an entree. There could have been toppings for the price, but the crust was awesome and we had definitely had leftovers. I would eat there again, but I'm not sure I would make a special trip. I must give props to our server, she was attentive but not overbearing and made it a good experience. Love this neighborhood restaurant. Service great and good always delicious! Great Neapolitan pizza place. Very accommodating and great food and service. Pizza is great. The daily special in the board is always wonderfully. All the items on the Burrata Bar are amazing. We tried the roasted olives they were even better leftover the following day! A great value. I was wanting some great pizza - something that I don't eat very often and found Dough Pizzaria. The table we got was right by the door and it was so close to another table it felt like it was some kind of double date instead of the intimate dinner I was wanting. I read the reviews and I was looking forward to it. One mentioned a surly bearded server - guess what, we got him! Literally no personality, was a walking robot, and frankly didn't care if we were there or not. So, for two $19 pizzas and a couple of drinks it was a little ridiculous. Honestly wish I could have the night back. The pizza and service at this restaurant is outstanding! Always a favorite for my wife and I!! A nice glass of Chianti, salad and a pizza!! Food is delicious, service excellent but the restaurant is tiny therefore on a Saturday night, its very loud and tables are on top of each other. I could hear the entire conversations around me and it was very hard to focus on my own. I decided against sharing personal information because I was worried the other tables would overhear. Ive never had to question that at other places. 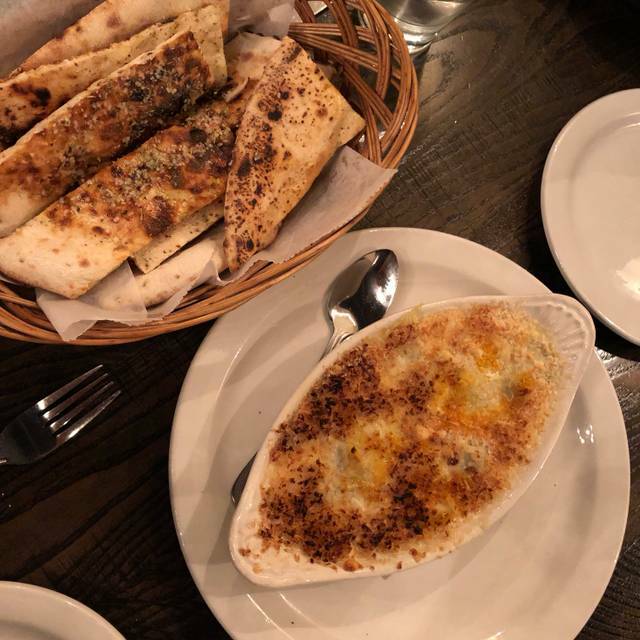 Dough is our absolute favorite restaurant in all of Plano. We love the food, the ambience, the cocktails, and the service. The Italian margarita cocktail is phenomenal. Our favorite pizza is the sun-dried tomato and Burrata pizza! You won’t regret it! Great place for any occasion! We love the original location in SA. Our order staples: truffle burrata, pizza with arugula/truffle/balsamic/prosciutto, and of course, vino. Sadly, this place fell short on many levels. The atmosphere was simple and well done. 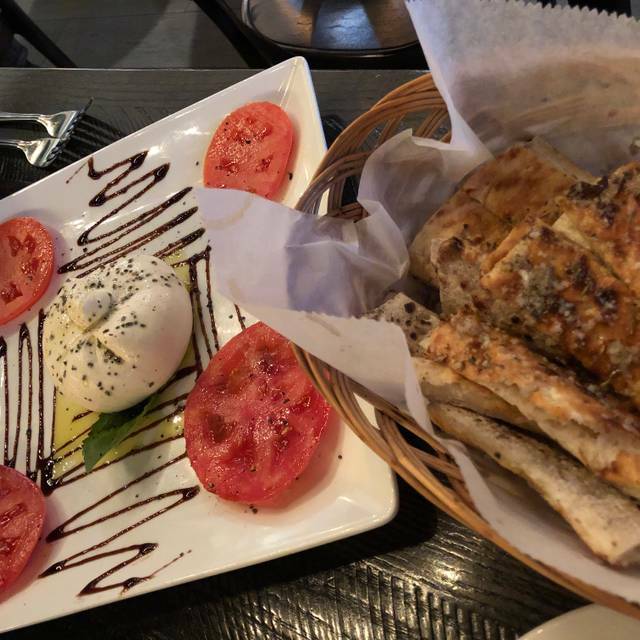 Our mozzarella appetizer was wonderful and the best part of the meal. The pizza was blandly seasonless. My friend had the spaghetti and meatballs special and it was very bland as well. 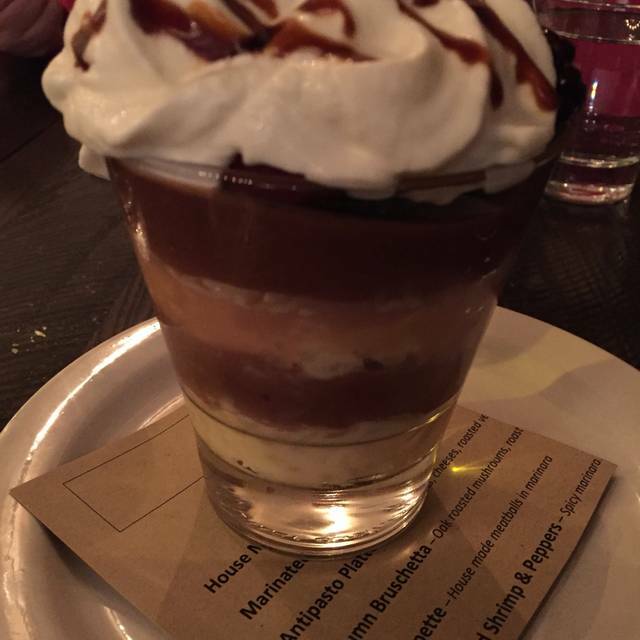 We ordered the Nutella panini dessert, because Nutella! How could you go wrong? The bread was nothing special and it was completely burnt, so disappointing. To top it all off the service was terrible! We had the only two male waiters in the place and neither one smiled once. They dropped the food on the table and would leave immediately without asking if we needed anything. We never had our iced tea refilled. They completely ignored us. This was some worst customer service we have ever experienced at a restaurant. We will never return. Great staff. Friendly and warm. Good food. Food was delicious. Waiter seemed to have more tables than he could handle as our water glasses were not filled enough. Makes one think that the restaurant may have small water glasses to encourage patrons to buy drinks. It was really cold when we first arrived - the air conditioning was running in the winter and it was freezing. We almost left but decided to stay and I’m glad we did. They got the temperature figured out and the food was terrific. I heard about DOUGH in SA, and knew of the one at Preston & Forest. We had our first visit last week and had a great time. I did not know what to expect...the location is tucked into a strip center and usually that can't be good. I was wrong. Well kept dinning room and everyone was super friendly. Our waiter was awesome, and timed our courses perfectly. Gotta' try the Cesar with Polenta croutons. We also had the B.A.T. pizza along with a Margharita, both were well baked, and not over sauced. Don't pass on the meatball App! I could not tell if I enjoyed the meatball more or the marinara. Good wine list, cozy small dinning room. Great place for parties of 2 to 4. Our server, Brennan, was outstanding and very attentive to our needs. The pizza, as usual, was very very very outstanding. Very good pizzas. A little on the expensive side for what is essentially a strip mall pizzeria, but service and food were excellent. Good place for kids. Good pizza! Dough is usually great, service is usually great . . .the food and service yesterday were off. First pizza arrived burned but they served it anyway . . .we asked for a re-do. The server knew it was burned and even told us the second pizza we ordered was being remade since it was burned . . .so why serve us the first one that is also burned . . .Bottom line is, they finally did make it right and it was tasty as always. Not sure they understand the concept of the customer is always right . . .we wanted things like we wanted them and told him it was okay for an extra charge, if they would only make things as requested. We have done it before there . . .but it was a bit challenging to get the message across. Overall if it was my first visit, I would not return, but we have been there before and its not the norm . . .just an off day . . .and we all have those! Far better restaurant than the neighborhood shopping center front presents. Our server was very nice. Just the right amount of attentiveness. Wish I could remember his name! Great food and appetizers! Cordial staff. Drinks are pricey. Really enjoyed the Italian knowledge. Good all around. It's our new favorite restaurant. We're addicted! Delicious pizza, craft cocktails, attentive service. Always, always, always delicious! Had the spinach salad and husband had the Bolognese. Two clean plates! We’ve had most of the pizzas on the menu and enjoyed each one. They will always customize a pizza for you as well. Dough has such a charming neighborhood atmosphere and people really do seem to know each other from table to table. We’ll be back soon. I have eaten at every Neapolitan pizza place in Dallas, and this place is the best bar none. 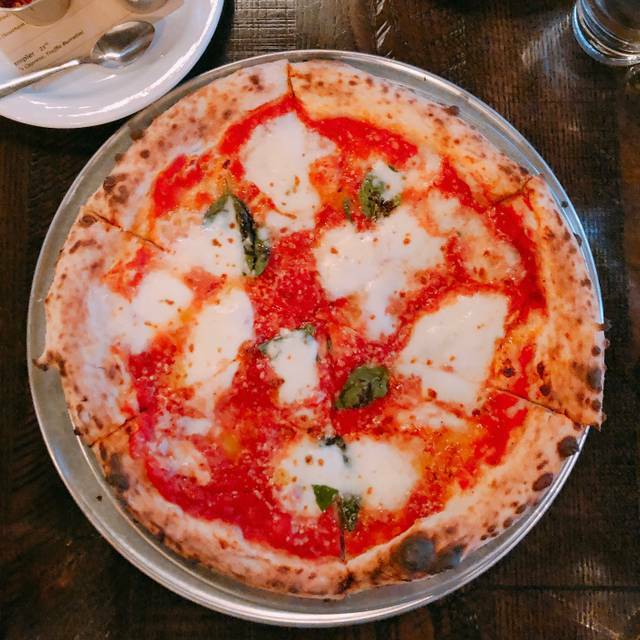 Dough continues to be one of our local favorites. The food, service and ambiance are perfect for a casual family dinner or date night. Oscar was amazing and Brad and his team exceeded our expectations as always. We will be back soon! The Dough Sangria is devine! This was our second time eating at this location and both times we were seated outside. I would recommend if you can to get seated inside for better service. The pizza is really good we had the Willow Bend. Tables are close so it is a little hard to have a private conversation. But the pizza makes up for that in spades! Service was great and we had a great time. If only Co Owner Brad Liles would take the time to say hello to "all" the guests when they walk in and walk around to make sure everyone is taken care of, things would run smoother. 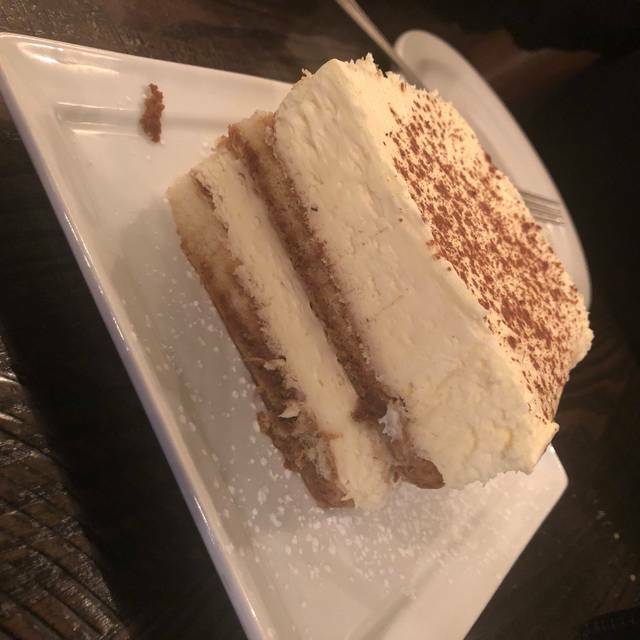 The food is always outstanding and we highly recommend Dough. I've been to Dough's Pizzeria twice now. The food is extraordinary. The staff is so friendly. It's definitely one of my favorite restaurants for business meetings and lunch with my son!